Trump’s Claim He Can’t Be Impeached For Obstruction of Justice Defies History. 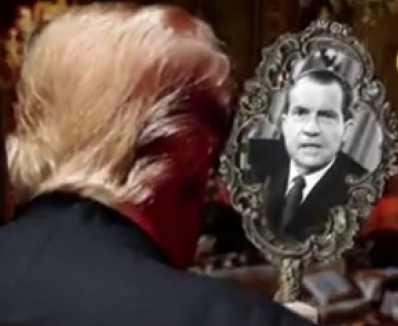 The Ghost of Impeachments Past Haunts Donald Trump. John Dowd, the same brilliant attorney who claims he drafted Trump’s tweet that many have interpreted as an admission of obstruction of justice, has advanced a disturbing defense on his behalf of his client. Attorneys are supposed to protect their clients from liability, not create it. So Mr. Dowd has a problem. Mr. Dowd’s argument lacks historical perspective or support. While America’s impeachment proceedings dataset lacks numerous points, the ones we have make clear that Obstruction of Justice is a basis for impeachment. Nixon’s Article of Impeachment for Obstruction of Justice. On July 27, 1974 the House Committee on the Judiciary overwhelmingly (by a vote of 27–11) approved an Article of Impeachment against President Richard Nixon that included a charge that Nixon “obstructed, and impeded the administration of justice.” The Article of Impeachment alleged Nixon by his actions and words sought to “obstruct the investigation of” the Watergate break-in. So not only was there an Article of Impeachment against the President for obstruction of justice” but the manner in which justice was obstructed was by obstructing an investigation. It wasn’t even an investigation into something the President directly did. Sound familiar? The passage of these Articles of Impeachment drove Nixon to resign less than two weeks later rendering the matter moot. Clinton’s Article of Impeachment for Obstruction of Justice. On December 19, 1998 the United States House of Represented flat out voted to impeach President Clinton for Obstruction of Justice. The president obstructed justice in an effort to delay, impede, cover up and conceal the existence of evidence related to the Jones case. — Article of Impeachment against President Bill Clinton. The charges against Clinton focused on his efforts to obstruct and delay discovery in the Paula Jones lawsuit. So once again the obstruction of justice allegation related to efforts to obstruct investigation. requires that he forfeit his office." --Jeff Sessions, Senate Trial of President Clinton. The Senate acquitted Clinton but not because Obstruction of Justice was not a legitimate charge. Most Senators voting to acquit did so because the underlying misconduct involved was completely personal and unrelated to his job. That contrasts sharply with the allegations against Trump involving his conspiring with a hostile foreign power influence his own Presidential election. The Finding of Unlawful Command Influence Against Donald Trump. Recently a United States Military Court found Donald Trump exerted “unlawful command influence” when making comments about the court martial of Bowe Bergdahl. The judge considered Trump’s unlawful command influence a matter mitigation on Bergdahl’s behalf in sentencing when the judge gave Bergdahl no prison time. That decision set off more Trump tweets that constituted more unlawful command influence that will likely be raised in the appeal process. While not relating directly to Obstruction of Justice, the findings against Trump in the Bergdahl case strongly repudiate the claim of Trump’s attorney that as America’s chief law enforcement officer the President has every right to express his view of any case. The premise from which Mr. Dowd operates is quite plainly false. With legal advice like Dowd’s you can see why the President is stupidly undermining legal his own legal cases, such as the one against Bergdahl. Now Trump’s following Dowd’s legal advice in sending that tweet has bolstered the case for Obstruction of Justice against Trump. Impeachment may be for whatever reason Congress deems. In the past, Congress has made quite clear that Obstruction of Justice is a basis for impeachment.